How well would you say you manage your money? Amber Dugger believes you are better at managing your money than you might think. She wants to help you prioritize your spending habits by investing in things that energize you and spending less on stuff that doesn’t make you feel joy or has meaning. 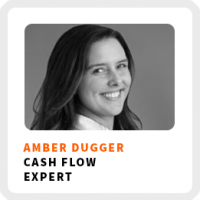 Amber is a cash flow expert who helps entrepreneurs gain clarity about how to invest their money, so they can focus more on the work that energizes them. Be sure to check out her Profit For Keeps course to learn how to build more intentional spending habits! What cash flow actually means and what it doesn’t. The psychological differences between paying for things with cash and credit cards. How to immediately start getting clarity and control around your personal cash flow. How she found joy in her work by finding joy outside of her work. Why she feels like she has more security now working on her own, rather than working for someone. Ideal work environment: With noise-canceling headphones listening to really good, non-verbal music like from Focus@Will; being in a really beautiful, white space with plants and a comfortable seat; with a really clear goal for the session; having coffee or tea at hand; and having a nice, clear workspace. Superpower: She can knit in the dark. Definition of success: The number of times that she smiles and the person in front of her smiles. 90-day goal: To welcome 30 people per month into her Profit For Keeps program. 1) Not sitting down and asking yourself – assuming you have no debt, you have savings, that all of your bills are being paid on time and without strain: what do you want to do with the money that comes into your business on top of that? 2) Having that goal in mind provides a foundation for organizing your money. 3) From there, you can reverse engineer a true revenue goal that works with your business strategy.